Are you visiting East Belitung in the near future? It is better to have some references. For example, you have Pangkuan Hill. The locals also call it Pangkutan Hill. Pangkuan means “lap”. According to the legend, a woman died on her lover’s lap on this hill. They ran to the hill due to their unapproved relationship by the elderly. Today, the hill becomes a tourist lure in Belitung. In fact, it is one of the best nature tourist spots in this region. If fact, it has an increasing popularity these days. The location is in Kelapa Kampit District. Pangkuan Hill is surrounded by dense trees and plants. Though, it features a satisfying accessibility. Even though it is widely recognized by the locals, the visitors mostly come from outside Belitung. Some of them come from Bangka Island. In the midst of the hill, you can find numerous outbound facilities. 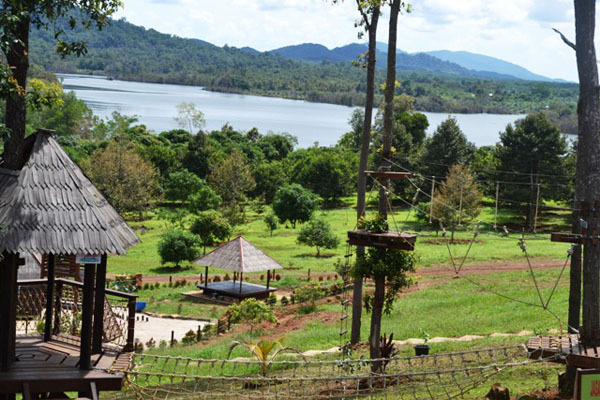 These include flying fox, ATV, trampoline, high rope, and giant swing. In a nutshell, it is a place for those who love outdoor activities. It is also suitable for a family vacation. The hill is actually agro-tourism. You only need to reach Mentawak Village. The most popular activity is flying fox. It is able to elevate your adrenaline, for sure. Even kids can enjoy this challenging action. There is an entry fee. Also, you should pay an extra fee for each outbound game. No worries. These games are affordable. Apart from outbound activities, Pangkuan Hill is famous for traditional crafts. You can buy them from local sellers. Make sure you get some souvenirs for your friends or family. Since you are going to spend much money in this location, you must have prepared. The cost increases during holidays, as well. Make sure you can cover your family’s liabilities. It is going to be a fun vacation, so it is worth your money. Another fun activity is sightseeing. Pangkuan Hill features beautiful scenery. In the east, you can view mountainous landscapes. Also, there is a famous Parit Kemang Lake. These views are indeed appealing. The best time to visit the hill is in the morning. You can clearly enjoy the sunrise from here. In the west, you can witness a beautiful Tajam Mountain. It is covered by dense forest and beautiful nature. On top of that, the hill features cloudless sky and soothing atmosphere. What a great place to do outdoor activities. The simplest way to reach Pangkuan Hill is from Tanjung Pandan. From Jakarta, you must head to Hanandjoeddin Airport in Belitung Island. From here, you can take a car or other vehicles to Kelapa Kampit District. The trip takes about 50-60 minutes. The hill is located in Mentawak Village. The road is smooth, so it is going to be a comfortable trip.